It sure is hard to be humble when you're a swashbuckling, egocentric super-hero. But our gallant guy-in-green tries his best as he swaggers through The Somewhat True Tale of Robin Hood, a frantically funny, Monty Pythonesque retelling of the classic. This time around, the legendary legend, in his never-ending quest to aid the needy, encounters a lovely damsel-in-distress (oddly obsessed with skin conditions); an ever-scheming sheriff who would rather bowl a strike than hit a bull's-eye; a gold-hoarding, bad-guy monarch wannabe; and a good-natured "Town's Guy" who manages to make his way into every scene, whether he belongs there or not. 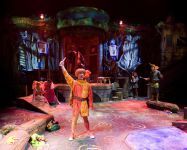 Combine them with an expandable band of spoon-wielding Merry Men whose collective IQs equal six, and you've got an irreverent jaunt through Sherwood Forest you won't soon forget! "The play is very funny. 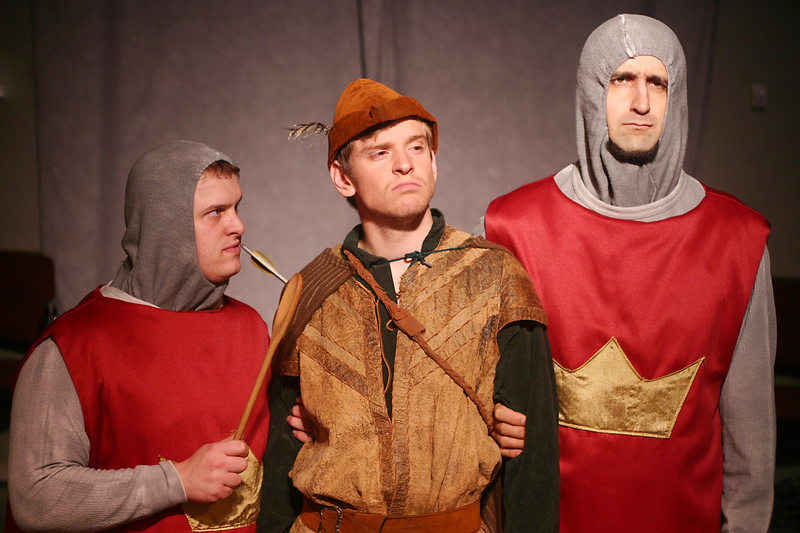 It has a Mel Brookish take on Robin Hood. It also gives the director and actors freedom to try different things. It's a lot of fun." 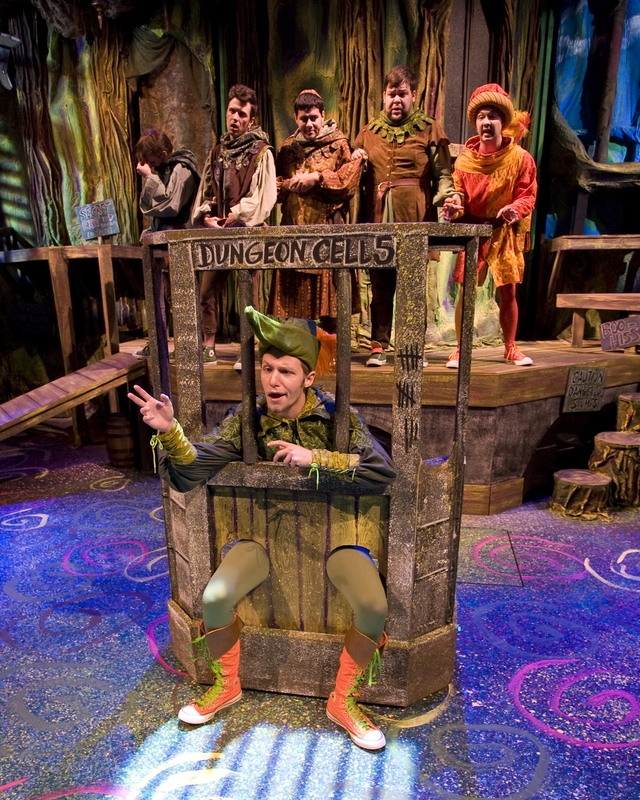 Review by Jeffrey Brown, Chattanooga Theatre Centre, Chattanooga, Tenn.
"A wild success for our middle school group! Well liked by both cast and audience. Reminded us of a "Mel Brooks" for the younger set. Lots of fun for everyone!" 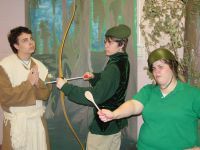 Review by Jeff Steger, Saginaw Arts and Science Academy, Saginaw, Mich.
"Funny story, not the typical Robin Hood story. Great for casting teens or adults." 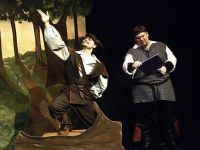 Review by Tony Neri, Somerset Valley Players, Somerville, N.J.
"This play was easy for our actors to memorize; I wouldn't be afraid to use it with middle school students. I would rate it G for all audiences. It is funny and great fun to produce. We had record attendance for this play!" "The students loved this! This show is somewhat of a tradition here at our school. The students like to revive it with the Drama II kids every couple of years. Great fun!" Review by Molly Grasso, Papillion LaVista High School, Papillion, Neb. 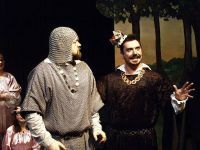 "Delightful comic script which was a great "Monty Python"-like approach to this classic taleÑa wonderful script for middle school actors and audiences." "I used this play on a recommendation from another drama teacher. I liked the flexible castingÑyou can use anywhere from a dozen to 30 kids. We had a great time doing it, and our audience (kids grades 1-8 and teachers) loved it!" 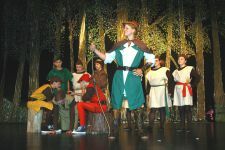 Review by Katherine Miller, Paul VI Catholic High School, Fairfax, Va.
"My cast enjoyed the concept of including the technical director and I found it hilarious for them to use spoons instead of swords for the merry men. It was a delightful show and easy to produce. The script was clever and fun." "The more we practiced, the funnier this play became. The very young to the old enjoyed the hilarious adaptation of Robin Hood. From witty dialogue to simple slapstick, Mary Lynn Dobson has created a winner! Easy to stage and be creative." Review by Sarah Witt, Lindsay Holy Family High School, Lindsay, Neb. "One of the funniest plays I have ever read or directed. It is appropriate for all ages and is easy to adapt for different cast sizes. 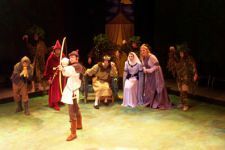 The audiences loved it, too; the laughs began from the start and didn't stop until the play finished." 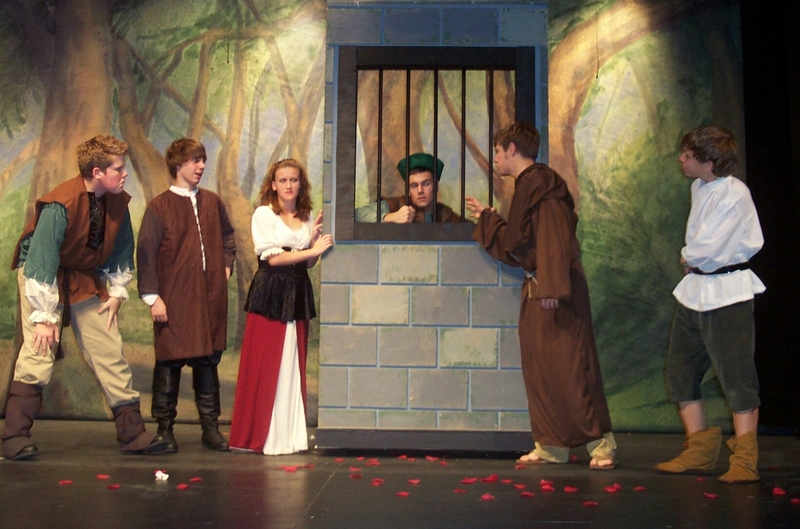 Review by Jessica Kropp, Mena High School Drama, Mena, Ark. 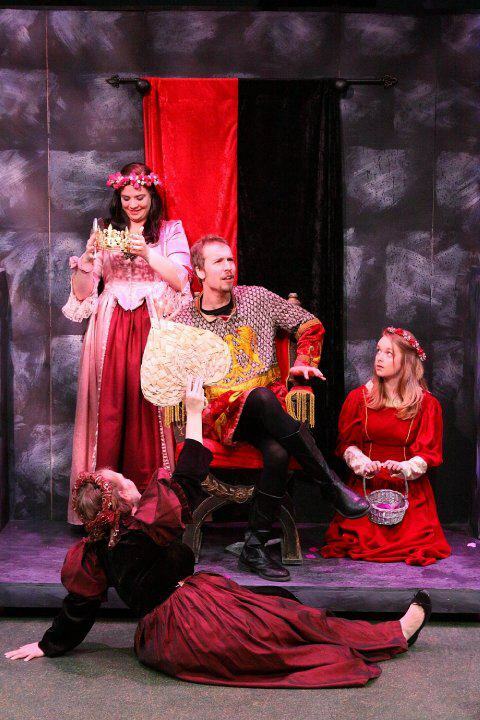 "An absolutely rollicking play! Hands down, one of the best our school has ever produced. Our cast of eighth graders flew with it and gave a stellar performance. Mary Lynn Dobson has a dramatist's voice and an impeccable sense of timing. I hope she writes more for this age group." Review by Judy Bellamy, Loudonville Christian School, Loudonville, N.Y.
"A terrific script with lots of funny characters for young actors to perform along with jokes and bits an adult audience will enjoy." Review by Greg Krumins, Great Plains Theatre, Abilene, Kan.
"The actors and audiences loved this play! 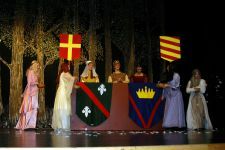 It was a delight to direct and perform. There was something for audience members of all ages." 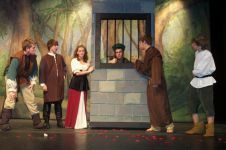 Review by Jennifer Couling, Concord High School, Concord, Mich.
"Our audiences loved this take on the classic tale! It was our top selling fall show ever, with crowds loving the hilarious lines, physical humor and funny characters! It was our second time doing this show and our biggest fall success!" 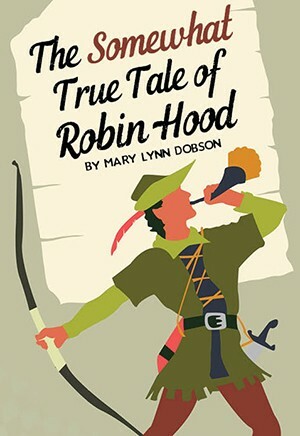 Review by Lynn Brant, Zillah High School Drama, Zillah, Wash.
"This show was very fun to produce. One audience member was heard to say that it was very reminiscent of Monty Python!!" 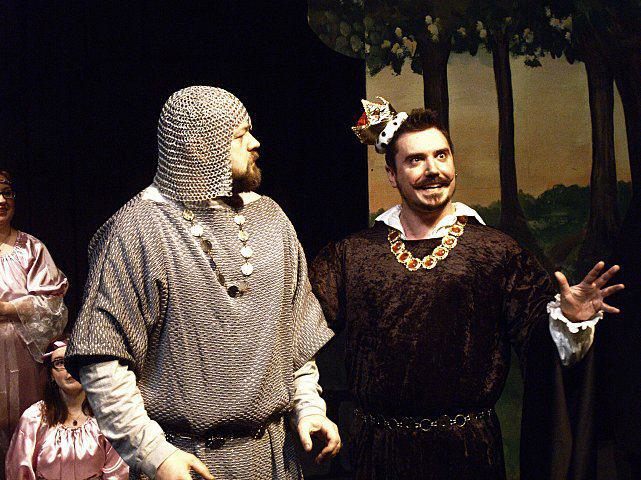 "Have you ever wondered what would happen if Monty Python met up with Mel Brooks to tell their version of Robin Hood? Well...um...poor Sherwood Forest would never be the same again." "Excellent! It is funny and witty. My 7th and 8th graders enjoyed working on it and seeing it. I hope to be able to direct this one again. I would love to act in it. We added physical, visual humor to the great dialogue." "This is a very clever play good for many ages. For instance, opening night I sat between a 5 year old and a 20 something -- both enjoyed it immensely. My wife (40), not often charmed by children's plays, had a great time as well." "Robin Hood is perfect for middle schoolers. 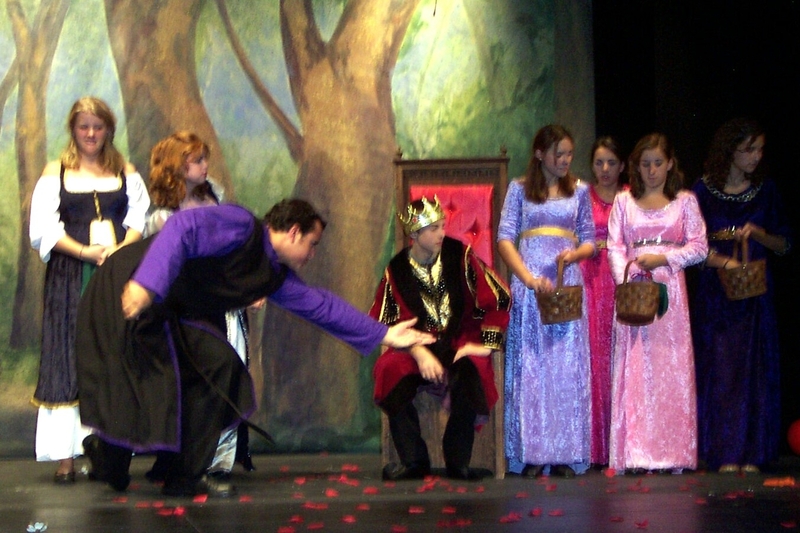 It gives so many kids a chance to be part of a production without too much pressure. At the same time it presents a challenge for the leads. Jokes that stand on their own help immensely." "The Somewhat True Tale of Robin Hood is a wonderfully funny, well written spoof on the traditional tale. 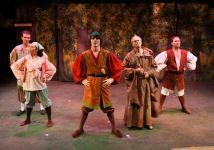 Bumbling merry men complete with wooden spoons for swords, a skin-condition-obsessed Lady Marian and an egotistical Robin make for a great script." Review by Mary Jane Smith, Hamden Hall Country Day School, Hamden, Conn.
"Don't be afraid to have fun and think outside the boxÑit might pay off. We took our own approach and it was great fun for all!" Tip by Jeff Steger, Saginaw Arts and Science Academy, Saginaw, Mich.
"There are wonderful websites that offer free sound effects. The bowling sounds really enhanced our production. 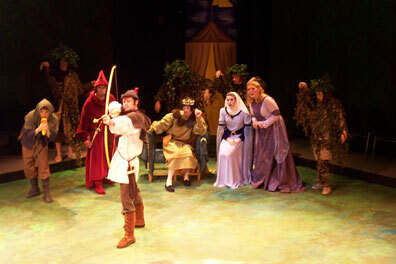 Also, women playing the Merry Men works great." Tip by Sarah Witt, Lindsay Holy Family High School, Lindsay, Neb. "Propwise, we had the sheriff carry a hobby horse in his initial appearance. For a sceptre, we gave Prince John a fly swatter with a plastic hand on the swatting end. He did a great job of gesturing with it. We also sat him on a larger-than-life throne." 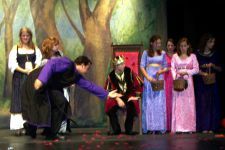 Tip by Judy Bellamy, Loudonville Christian School, Loudonville, N.Y.
"The play is a great one to do if you're wanting to please a very wide age range." Tip by Donna Chalmers, Fifth Row Center, Flowery Branch, Ga.